By Shara Wilkey, Capt. USMC Ret. I graduated from Fountain Valley High School after marching I President Ronald Regan’s Inaugural Parade plating the Tuba. I auditioned for the US Marine Corps Band about two-months after returning from Washington DC. Within a month of graduating high school I was at Parris Island, South Carolina at boot camp! After boot camp, I went to the School of Music at Little Creek Amphibious Base, Norfolk, VA for 6-months. Then I was stationed at 29-Palms, Ca Drum & Bugle Corps. During this time, I was able to play at a taping for a USO Anniversary in Hollywood, having dinner with Scattman before he passed away then the Drum & Bugle Corps Unit drove down to San Diego, CA where I was first Women Marine to sleep on a US Navy Ship USS McKee for a change of command the next day on the ship. I have played for the Queen of England and again President Regan as a US Marine the second time! After a regular hearing test, and major hearing loss was detected, I was forced to find a “quieter job.” During this time, I read messages about applying for college and becoming an officer. I applied for these programs and was accepted for Broadened Opportunity for Officer Selection and Training (BOOST.) I was then selected for the Marine Corps Enlisted Commissioning Education Program (MECEP,) where I attended San Diego State University and was a “Blank Holder” with Graduating NROTC and MECEP Class. When I graduated from The Basic School, I was sent to Communications School also at Quantico, Va. I was then sent to Okinawa, Japan Marine Wing Communications Squadron-18. I continued to have problems with my knee so I bicycled rather than run most of the time or did pool work outs. I was later deployed several times to South Korea and once I was deployed to Western Australia for several weeks. After21-months I was finally able to see one a US Navy Orthopedic Doctors, who looked at my knee and basically said Patellofemoral pain syndrome, and stated “You’re going to the Land of the Ortho Doctors!” I am not going to help you. So more medical doctors time and delays for a proper diagnosis. Three-months later I was stationed at Parris Island, South Carolina and Gulf War’s Desert Shield started. Now all the good doctors were sent to the combat zone and the not so good doctors were left in the rear. I had a civilian doctor who worked on base and put me in a leg brace from high hip area to my ankle, in short order my leg atrophied almost 3-inches! I wore this brace for approximately 6-months. During this time, I learned what a Kinesiologist is and a few of them tried helping me. I got better at swimming up to 2 miles even with three T-shirts, and then working out in the gym with weight machines mainly then with my upper body and arms. Finally, late in February 1991, I was sent to the Charleston VAMC Charleston, SC to have a 3-Phase Bone Scan. It turns out that VA at that time had never had a “hot” evaluation! When the report was read it seemed the overhead speakers went crazy calling me back to Radiology for more exams procedures! Then the civilian orthopedic doctor working on base was informed that I could be sent to another military base hospital for higher level care to Portsmouth Naval Hospital (PNH), Norfolk, Va. It was at Portsmouth Naval Hospital I had various testing, and meeting my first psychiatrics. Then the orthopedic doctors did more exams to ensure nothing else was going on with my knee that the MRI, X-rays and others could miss due to the knee being a very large joint in the body. Afer an arthroscopic exam of the knee in question, I was informed there was no mechanical problems but I had RSD (Reflex Sympathetic Dystrophy,) as this was pre-1994 IASP changing it to CRPS. Eventually, after almost a year at Portsmouth NH, I was able to return to full-duty back and back to Parris Island, SC. I eventually had to have a few more blocks and one of the doctors put me on Prozac, long before any “Prozac Law Suits.” I complained almost from the start about this medication causing me various problems. I was told by many in the “Medical Field.” “This is a new drug. It is safe. You can’t be having those problems.” Due to Prozac and CRPS/RSD, I was eventually medically retired from the military. About 5-years later were the first class-action lawsuits against the Prozac manufacture. Being in the military the Soldier Sailor Act I could not join this. In 2007, through Medic Alert, I did a DNA Pharmacology test which showed me and anyone I would show this test to, I was allergic not just Prozac but all SSRI drugs and all SNRI drugs as well. I was officiating Baseball, Softball, and Soccer, I kept doing these sports from youth, High School, and adults out I town to the military base Intramural Games. When my husband returned from overseas duty and was transferred to Camp Pendleton I continued with my Sports Officiating adding later Football, Water Polo, Volleyball, and Track and Field. I was able to do medical transcription part-time for several years as well. I later became Comptia A+ Certified on repairing computers laptops and desk top as well. I was feeling well with my CRPS seemingly under control with the current medications and physical exercise moving, that I decided to thru-hike the Pacific Crest Trail (PCT.) While preparing for the thru-hike and while hiking the trail I learned of trail maintenance of the PCT. While Thru-hiking was being planned I learned of a HS Football Camp for Officials in Reno, NV. I made plans to go off the trail for attending this camp, as well. While hiking in Northern California near the California Oregon Border I got a March Fracture on my left foot, which had been broken two other times in the past 10-years. After working real hard, as a football official, I was finally earned a Junior College Football schedule. Sadly, I had to turn in the schedule back the assignor, as I fell too many times as the head referee during a Junior Varsity High School football game. Even in the wheelchair, the only sport I could continue was Track & Field. When my left foot broke, it triggered Lymphedema in my lower body lasting a little over 2.5 years and put me in a wheelchair. I was told by civilian, military, and VA doctors that I probably would not walk again. My husband of 15-years walked out of our marriage. Some of being told I probably would not walk not being proper diagnosed with lymphedema. On my own I did what felt right beside the typical nerve blocks, trigger points, and other. I did more mental relaxation, use of lavender scented candles, deep tissue massage really worked but yes painful too. As the economy was tanking during this time, and the loan on my house was due to go up I was able to sell and moved an approximately an hour East of Reno, Nv. While in a wheelchair, I learned about owner-trained service dog and the trained my own. I got her from the shelter near Anaheim, Ca. Even when the lymphedema settled down and left the body my legs and core was very weak. It took time for me to regain my strength to walk or ride a bike. I had trained my service-dog to help pull me in my wheelchair, so now I had her help me pull me on my bicycle. The nice thing while near Reno, Nv with my service-dog pulling me I met some people who had horses. I liked horses and had ridden when I lived at Camp Pendleton for several years and later in Orange County, Ca as well. When Doctors told me to stop ridding horses, due to the last horse pulling my shoulder out of joint/hyper-extending, I got really ill physically and my CRPS pain, with comorbidity problems got greater as well. So, this time, I went back to riding horses for others first, as a safety person so not ridding alone, exercising horses, or extra hand for exercising and/ or feeding as well. In time, I eventually bought my own horse, then another, and had the strength to get on all by myself again! I helped and met others who had horses, got square bales loaded up for myself and others as well. 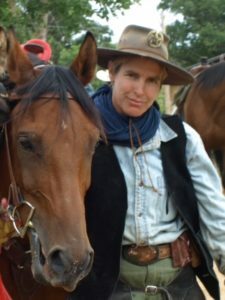 I have ridden the Pony Express Remount in Nevada one year along the original trail used then too! As I started feeling better than I had in a long time, I started to look back on my health and other things as well. I read about Medic-Alert doing DNA Pharmacology testing, around 2006. After I got the results, I found a way on the internet to get a hold of one of my former US Navy Medical Doctors in San Diego, CA about the results. I discovered over time she was able to reflect and agreed with what she saw had since learned herself, and started doing DNA Testing on all TBI patients she saw at NMC San Diego from that point on to help them not go through the “hell” I had to. I was able to read about a pain doctor working on the East Coast for the US Army military and emailed him about my results, as well and any questions to verify my facts he could check with my former doctor in San Diego, CA. Due to many homes already being planned to be built, new roads and bridges designed and even started, I started looking for another place to move but was not rushing. A friend of mine, who I bought my horse from, needed help in moving to their new home in Nebraska., I said sure. It was during this trip, on the return part, I found a place in South Dakota that was for sale. In 1991. When I was first taught how to do self-guided mediation for reducing pain and relaxation, I made up an imaginary place I thought. I had used this “imaginary place” for some 16 plus years. I did not know it was rea, but discovered it really was real! l When I saw it was real, I had to do everything I could to buy it and that is where I live today and plan to for the rest of my life. I am still building, adding on, and improving my home here in South Dakota. I will say my horses and barn cats lived better than I did my first few years. I have since worked for a horse farm and learned how to train foals, wean them, and even breed mares as well properly. I have boarded horses as well as goats at my place. In building my home, I made it so that my only heat was from firewood. Part to keep me moving, year around, regardless of temperature so I am always moving. I have found moving to be the best even if it hurt to move and keep moving. Over time, I finally decided to join Facebook and discovered the Military and Veterans CRPS/RSD page, as well as several other CRPS types of pages. I really enjoyed Nancy Cotterman, RN page talking about ketamine. I had been reading about ketamine since early 2000. Finally,my former US Navy Doctor commented that she had been trained in ketamine and saw it working. When I started seeing new doctors in Rapid City, SD area, I started having to “fight” that I had CRPS. It turned out that the VA Neurologist locally seems to not believe in CRPS let alone know how to properly diagnoses CRPS.The VA Neurologist said to me, “Oh, you are not in a wheelchair anymore, so you can’t have CRPS.” Since 2008, when I moved to South Dakota, I have continually had to fight for my CRPS medical care. My first few months, I needed to have a LSB for my right leg as the leg was atrophying by 1.5-inches and getting worse. I was not able to get this LSB, and my right leg gave out and I fell onto a rock directly on to the knee cap. Eventually, leading me to require another knee surgery due to a “chip bone in the knee cap,” which was in the shape of a pie with the point outwards towards the MCL. The chip finally tore my MCL. During this time, I travelled via military insurance to Colorado Springs, Ca to see my first ketamine doctor. For the first time in so, so long, I did not have to get totally poked as he was an active reserve medical officer in the US Army! He knew all the terms and equipment I listed off on how I had my original injuries for my RSD/CRPS. I had my first ketamine infusion, Sept 2009, not 36-hours after having the “Staples” from my knee removed. I did not know about having music, but having learned self-guided meditation I kind a sent myself into a dream state each time and it worked for me. I began asking the VA for this treatment but was told no. After joining Facebook then discovering the Military and Veterans with RSD/CRPS . I had learned of Doug Strand, Col USAF Ret is why I joined Facebook honestly. I discovered Doug’s CRPS/RSD on the internet and connected with him via LinkedIn originally. I continued pushing my local VA for ketamine infusions. The chief of staff at my VA kept telling my US Senators it was not allowed in the VA I then found information about Jonathan Haag USAF Ret and his coma-induced ketamine infusions at the Audie Murphy San Antonio VAMC in late 2010. I emailed and called my VA-VISN Headquarters for my area with no results. When some of those VISN-HQ Senior Executives came to my area for various talks etc., I would approach them and ask in person again with no real answer or help for proper medical care. I finally started emailing and calling to the DeptVA Secretary and every name that was in the DeptVA Washington, D.C. I proved to those in Wash DC VA Executives that ketamine infusions was based on medicine based evidence for helping those with CRPS. It helped that I had had ketamine-infusion twice before on my own via the Tricare Prime and it worked for me giving me back my life as far as I am concerned! Finally, in July 2014 I was told I had to go to my VA VISN Headquarters Pain Clinic for evaluation. Minneapolis Pain Clinic agreed I had CRPS/central sensitization and I needed ketamine, but refused to help my VA to get it. This caused more fights and locating a place that would take VA Fee Basis Pay. I would post my “trials and fights” on the Military & Veterans CRPS/RSD Facebook Page for others and to help them as well. I finally needed a ketamine infusion and was forllowed to get an “out of region treatment” a one-time at Walter Reed National Military Medical Center Bethesda, MD (WRNMMC) the first week of March 2015, for a 4-hour infusion after evaluation. This was also due to as my former ketamine doctor not being sure when he would be able to do ketamine at his new location, in a state, that had never had it before, Nebraska, at least as inpatient. On the way back home from WRNMMC my Ketamine Doctor’s office called to set a time and date at the end of March 2015 for a 72-hour infusion. I let other veterans know of this success and how I had accomplished it and helped in “PreFab Letters” basically having the names, titles and emails address of those in Wash DC VA Executives so others could get ketamine if they wanted. Soon a few others and via the VA Choice Program could get ketamine-infusion from care in the community. Ii have been trying to keep a list up-to-date of VAs doing ketamine-infusions and locations that take VA Fee Basis be it outpatient or inpatient ketamine-infusion since then. Last year when I had the unfortunate luck of breaking my pelvis and femur head and greatly needed an inpatient ketamine-infusion, my ketamine doctor that I had been seeing unexpectedly left. This, sadly, allowed my local VA Chief of Staff (CoS) to stop any chance of me getting ketamine for my CRPS. My VA PCP wrote an Urgent Ketamine-infusion consult, but unknown to me the local COS cancelled the consult. This started some determination on my part to email even more in VA Executives in Wash DC every day, holiday’s and weekends with CC: Jim Broatch, Dir RSDSA as well! After 40-days of this then backing down some the VA Under Secretary of Health emailed me back about the best thing on CRPS he had seen was Dr Padreep Chopra’s Denver, Co June 2015 Slideshow Presentation, which I and my boyfriend was able to attend then. At the end of Oct 2016, I was told to get my LDN prescription renewed. I had to go to another local VA Pain Clinic Team evaluation, but this time after that the Pain Team and myself would be at a Video Conference with the VHA Interim National Director of Pain Management and someone else. This someone else I was told then was the VHA’s “Ketamine Expert.” Even my boyfriend knew, as I did, this person was not a ketamine expert, as the first thing out of his mouth in talks about ketamine was, “Ketamine is a one or two times event in life maximum.” I told him, “He was not a “Ketamine Expert” that knowledge in the VA was at Audie Murphy San Antonio VA, were they performed a coma-induced ketamine infusion, let alone since 2011 have been doing ketamine infusions every month with just a little over 100- veterans getting ketamine infusions for pain since then. Still I was again lied to as my VA prescription for the past 12-months had run out on LDN was not written. Fortunately, my out in town PCP did write the LDN prescription. The VA did not write the LDN prescription for another 45-days approximately, and was not delivered to me until Dec 29, 2016. By late December 2016, I was still not seeing any dates for ketamine other than more “harassment” from my local VA, especially the CoS. Nearing my wits end and in the worst flare-up of my Systemic CRPS that I could recall in 29-years of this unhappy relationship with CRPS, I was still sending emails for help to VA Executives in Wash DC. I got another response back on Dec 31, 2016 from the VA Under Secretary of Health Dr Shulkin, who stated he was going to help me get the needed care I needed. I had already been setting up psych-clearance appointments locally out in town, for getting ketamine infusions through my non-VA Counselor to see a psychiatrist as Dr Ashraf Hanna and other ketamine providers require this prior to making any appointments with them. I informed Dr Shulkin that I knew of locations where Care in the Community was being provided by and paid for by the VA for myself and other veterans. Further, I stated my local VA, had been “bad mouthing me” on various diagnoses, which I could prove to be false, let alone I had been taking intra-nasal ketamine, daily since mid-November 2011, and ketamine troches daily since late-September 2016, via my PCP out in town provider. I also informed him of the other ways ketamine can be taken as the VA in San Antonio has been providing one veteran liquid ketamine daily for several years. I informed him of how some in the Mental Health fields were doing it via IM beside traditional IV with talk therapy at the same time for some patients around the US. Further, that others were taking ketamine by compounded pill form as well. Dr Shulkin, even after his appointment as the New DeptVA Secertary, had his staff called my local VA CoS and inform them I was to get ketamine at the location of my choosing, and I selected Dr Ashraf Hanna. Sadly, on part Dr Shulkin and/ or his staff had to call my local VA FOUR times, as one of my appointments, which I had proof was cancelled! I got a call from my local CoS this was not done and I stated wrong it was. The last few days of February 2017, I was able to see Dr Hanna in Clearwater, FL, and start my 10-day loading dose. Upon returning home and back to my local VA, staff strangely happy with me and the best I had seen in a long time. Then someone asked me what had happened to the local CoS as their desk and office was cleared out empty! I went to the one US Senator who had been trying to help me, and his office informed me the CoS was “under major VA Admin Investigation and doing “Special Projects.” I also was aware that some staff had reported the CoS for being retaliatory and vindictive even to fellow VA Employees. In the meantime, since January 2015, I have had to have a right total knee replacement, but I would not do it unless I had the proper ketamine surgical protocol followed per Dr Padreep Chopra guidelines written up for RSDSA. As the Minneapolis VA, which does ketamine infusions my VISN HQ, will not see any veteran outside of their VA location for ketamine-infusion I kept asking for Walter Reed NNMC, since I knew they did ketamine infusions and can do surgery for my now much needed hip replacement, via the DoD/VA sharing agreement for care with the proper ketamine protocols for CRPS patients. Within 3-weeks after my VA sent in the consult request for care, I had an appointment and was on my way for improved medical a care for me. This does take a lot out of my boyfriend as pre-9/11 Veterans our “Caregivers” do not get paid. He is not able to work a full-time job especially since my hip was broken. Going to Florida he had to drive almost 80% or more of the way, on the way home we could share equal driving time finally. Getting my total hip-surgery with a lot of limited mobility especially in the beginning, he has had to be with me at Walter Reed NNMC, but is studying so he can get his cyber hacking certificates and others so he can do some more work from home or a far in the future. I am hoping that my meeting with the Director of Defense & Veterans Center for Integrative Pain Management (DVCIPM) to possibly facilitate help for all DoD/VA Veterans with CRPS, let alone other central sensitization problems and Chronic Pain Patients can be helpful for all of us which is at the end of Oct 2017. Hoping to better dialog with the providers and researchers for Pain from a long term CRPS patient.